Chet Pickard led the Western Hockey League with 46 wins, and was fourth with a .918 save percentage. He topped those numbers in the WHL playoffs, leading the Americans to the Western Conference final with a 1.78 goals-against average and .937 save percentage. Chet Pickard isn't afraid of ghosts or legends. He is what he is, and what he does is stop pucks and it may be hard, but it's certainly not complicated. Pickard had the unenviable role this past season of replacing Carey Price in the Tri-City Americans crease. "All the media was talking about the Carey Price ghost," Pickard told NHL.com. "I never put pressure on myself. I knew I was a good goalie." Pickard showed that he could be more than just good. The 18-year-old netminder led the Western Hockey League with 46 wins, and was fourth with a .918 save percentage. He topped those numbers in the WHL playoffs, leading the Americans to the Western Conference final with a 1.78 goals-against average and .937 save percentage. He won the Del Wilson Trophy as the WHL's Goaltender of the Year, and added the ADT Canadian Hockey League Goaltender of the Year Award to his collection of hardware. His name appears right after Price's on both trophies. "Carey won the CHL Goalie of the Year and WHL Goalie of the Year last year," Pickard said. "So it's kind of cool Tri-City has two straight winners." Pickard has no trouble talking about Price, who was taken fifth overall by the Montreal Canadiens in the 2005 NHL Entry Draft, won an American Hockey League title with the Hamilton Bulldogs last season, and guided the Canadiens to the best record in the Eastern Conference this past season. "Carey is like my best friend still," said Pickard. "We were basically brothers for the past couple years, rooming together. You can take everything from a guy, or something from everything he does. He's such a soft-spoken type guy and a calm and relaxed guy. It's something that really rubbed off on me." One of those things was mental toughness. "He is very confident," said Al Jensen of NHL Central Scouting. "He is very strong in his crease and he isn't predictable. His net coverage is very good and he reads the play well. I think he presents himself very well in the net and he has very good goalie instincts. He is very consistent, which is a big positive for him. He is able to put any bad goals behind him; he doesn't let anything bother him yet he is very competitive." "I can say one of my best attributes is my mental status," said Pickard. "I think that's one of the strong points of my game. As a goalie you're under the microscope. If you're playing in a place like Toronto, you saw (Vesa) Toskala allow that one goal this year from the other end. It's something you have to shake off -- you have to put it behind you. You can't let it affect the outcome of the game or the rest of your game or the rest of your season, for that matter. "This year, there are times where I let in the first shot of the game and stopped the next 40. That's just something that as a goalie comes with experience and playing a lot and being in those situations. It's hockey, its part of the game. Things don't always go your way. You learn from it and you put it behind you, you block it out and you go on from there." 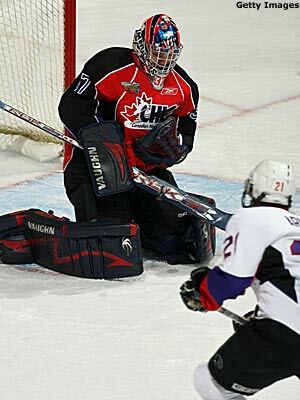 Pickard hopes to be selected early in the 2008 NHL Entry Draft. He's the No. 2-ranked North American goalie, and he had a number of interviews at the Scouting Combine held last month. "Some teams have been pretty good at pumping your tires, making you feel good about yourself," Pickard said. "Other teams have been a little tougher with things you have to work on. As a goalie you can always work on things. And with the rule changes coming up again and smaller equipment, you can work on every part of your game. "Teams seem to like that I'm a big guy (6-foot-2, 210 pounds)," Pickard said. "I'm an athletic guy and that sort of thing. But at the same time, they're not going to pat you too much on the back because they don't want you to get a sense of 'Oh these guys love me.'" There is much to love, though. "He is very athletic, very strong, plays the puck really well," said Corey Hirsch, a former NHL goalie and now a goaltending consultant for Hockey Canada. "A big kid, almost a Carey Price clone, and patterns himself after Price. When he plays he kind of looks like Price. It's pretty amazing." What's amazing will be how the next Tri-City goalie does in Pickard's crease.